On December 4, 2007, the District I Court of Appeals issued their opinion in Wright v. Wright, No. 2006AP2111 (Wis. Ct. App. Dec. 4, 2007) (recommended for publication). 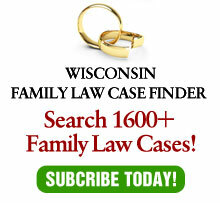 The decision affirmed in part, reversed in part and remanded with directions, the orders rendered by the Milwaukee County Court Judges John J. DiMotto and Michael D. Guolee. This is first of three articles on the case. This article will summarize its holdings; the next two will discuss its possible ramifications. Linda and Charles Wright were divorced following a marriage of over 21 years. The trial court found that Charles’ retained earnings in a company known as “FRG” were gifted and non-divisible. The trial court also found the majority of a Baird account, which consisted primarily of proceeds from a terminated trust, was a gift to Charles and therefore non-divisible. With respect to maintenance, the trial court awarded Linda half of Charles’ FRG salary, half of his FRG bonus or retained earnings distributions, half of FRG income reduced by retained earnings subject to a 45% tax rate, and half of the distributions from a company known as “GRAT”. The trial court did not include, for purposes of maintenance, any distributions from several other business entities, finding they had no income, any future earnings would be return on capital and counting income from these entities would constitute double-counting. The trial court also denied Linda’s request for an attorney’s fee contribution. The court of appeals, in a decision written by Judge Ted Wedemeyer, affirmed the trial court’s ruling for the most part on finding certain assets to be non-divisible. The appellate court also affirmed the trial court’s use of a tax rate of 45 percent as part of its maintenance order, finding it was within the range of what the experts proposed. The appellate court additionally affirmed the order denying Linda’s request for a contribution to her attorney fees. The court of appeals, however, reversed the trial court ruling that the money market portion of the Baird account was non-divisible, holding that unaccounted for deposits resulted in the transmutation of the money market account into a divisible account. More significantly, the appellate court reversed the trial court’s maintenance decision and remanded for reconsideration. Per the decision, the trial court erred when it failed to include a variety of sources of Charles’ income when awarding maintenance. Although the trial court found these entities were not currently making money, and therefore including them in the maintenance income consideration would be speculative, the court of appeals held that it was error not to order maintenance from any future earnings. The appellate court also disagreed with the trial court that any future earnings from these sources will constitute a return on capital, not a source of income, and disagreed that counting income from these entities would constitute double-counting because the value of the companies was included in the property division. On remand, the court of appeals ordered the trial court to consider income from all sources in determining the maintenance calculation. For one, where a trial court issues a lengthy, thoughtful decision, why is it a misuse of its discretion for the trial court not to include non-income producing sources for maintenance? Another question: Is it ever double-counting to exclude income from a business from a maintenance calculation, even when a business valuation may include the future income of the business? Moreover, where is the line where a trial court has discretion, as opposed to where an appellate court directs its actions? For more on these questions – and more questions – stay tuned for next week’s column.